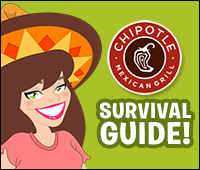 Is it just us, or is Chipotle Mexican Grill getting more and more popular every day? And while there are plenty of smart selections -- we love the build-your-own-meal flexibility -- there's also some shockingly fattening fare. Read this need-to-know info before your next visit! Best Bet! 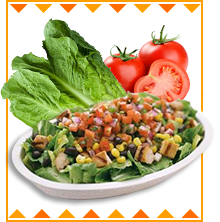 Salad: While some restaurant salads are calorie bombs on account of "hidden" ingredients, Chipotle's is perfect, since you choose exactly what goes on top. You get a 10-calorie lettuce base, and go from there. Tacos: The good thing about a three-taco order is that you have options. The soft corn tortillas are super, with 210 fat-free calories before filling -- not a bad start! The crispy corn taco shells have 210 calories and 7.5g fat, and the soft flour tortillas have 255 calories and 7.5g fat. Remember, those numbers are for the empty tortillas/shells. Watch Out! 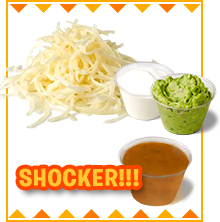 Burrito: OK, it's not super shocking that the burrito is the worst choice, but get this: The huge flour tortilla has 300 calories and a whopping 10g fat before anything goes into it! Even if you play it smart with the filling, that's not exactly an ideal calorie/fat count to start with. 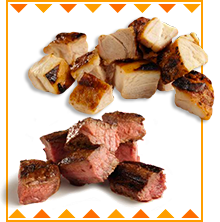 The veggies: The fajita vegetables are awesome and add just 20 calories and 0.5g fat. And obviously lettuce is a good choice; only 5 calories, and it really helps fill out your meal. 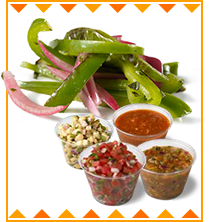 The salsas: When it comes to adding guilt-free flavor, you can depend on these condiments. 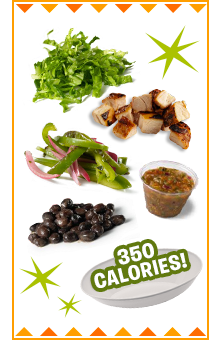 The Fresh Tomato and Tomatillo salsas add only 20 - 25 calories -- the Tomatillo comes in both red and green. (Sodium counters: The Green Tomatillo option has 50 percent less salt than the others.) The Roasted Chili-Corn Salsa is a bit steeper, but still acceptable, with 80 calories and 1.5g fat. The beans: Beans are a nutritious choice, but the calories can add up quickly at Chipotle, especially when you order a burrito or tacos. 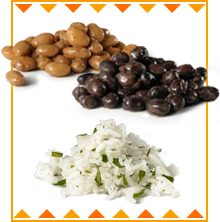 A serving of the pinto beans has 115 calories and 1g fat, and the black beans have 120 calories and 1g fat. Great for salads, no question! The rice: Chipotle likes to add oil to its rice, more so with the brown kind -- a 4-oz. serving of brown rice has 200 calories and 7g fat, while the same amount of the white stuff has 185 calories and 4g fat. The brown rice does have more fiber (2.5 grams as opposed to 1), so there are pros and cons to both. If you're starting with a carby base, consider skipping the rice, or request a half-sized portion. Our vote: Avoid it altogether, and get more veggies. More bang for your calorie buck! The heavy stuff: Cheese will add 100 calories and 7.5g fat to your meal; sour cream tacks on 115 calories and 9.5g fat, and guacamole contributes 200 calories and 19g fat. Get all three? You just topped your meal with 415 calories and 36g fat. OUCH! Shocker! Vinaigrette: Don't ruin a perfectly good salad by drowning it in 270 calories and 25 grams of fat! (And those numbers are for just 2 oz.!) Stick with salsa for flavor, or get this on the side, and use very sparingly. 2. Take advantage of the online Nutrition Calculator. While it's great that calorie counts are provided on the in-store menu boards, those numbers are presented as (very wide) calorie ranges, making it really hard to estimate the stats of your order. 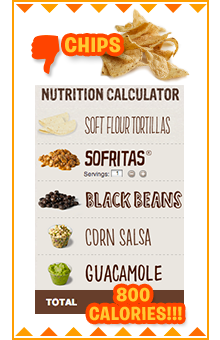 So make use of the rockin' Nutrition Calculator on Chipotle's website. Bonus: It's mobile friendly. 3. Don't assume healthy ingredients equal a diet-friendly meal. Even seemingly smart choices can add up to diet disaster. Case in point? An order of soft flour tacos with sofritas, black beans, chili-corn salsa, and guacamole (avocados are healthy, right?) adds up to 800 calories and 39g fat. Ack! Aren't you glad you have this guide? We bet you can think of five people off the top of your head who could use this info -- click "Send to a Friend" now! It's Friday the 13th! If you want to hide inside today but you're craving Mexican food like Chipotle's, whip up these four-ingredient tacos STAT.